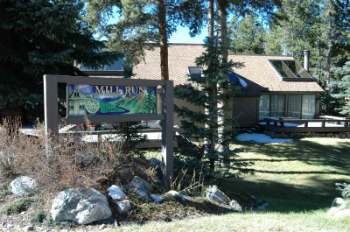 Mill Run Townhomes for sale are not run of the mill. They are large townhouses separated by forests from the busy condo loop nearby and face south to the Warriors Mark open space. The homes have open floorplans with two sets of large sliding glass doors that open onto exterior decks from which you can hear the nearby Blue River. The base of Peak 9 of the Breckenridge Ski Resort is a short walk away and downtown Breckenridge is only a few blocks north. The free town-wide shuttle stops on the east side of Mill Run. Discover more about the neighborhood, or start exploring the available Mill Run townhome listings below. In addition to quick access to the base of the Quicksilver lift on Peak 9, the Burro Trailhead is just a few steps further up the ski run, which is a great cross-country trail in winter or the start of a nice hike through beaver ponds at the base of Peak 10. Fishing is permitted for residents of Warriors Mark in the nearby open space. Any Mill Run home for sale will have a deck and access to the common yard, which is maintained jointly by the condo association. No unit has an individual lot, so Mill Run homes are condos, but these homes were built side-by-side and feel like town homes. The open living and kitchen areas are on the main level with big, south-facing windows. The bedrooms are upstairs along a hallway open to the lower level. No garages exist in Mill Run but there is ample off-street parking. Size: 1348 to 1469 sq. ft. Located very close to the intersection where Broken Lance loops back on itself, in Warriors Mark, Breckenridge. Drive south on Main Street to last stoplight at Boreas Pass Road, turn right on Broken Lance Drive. At the three-way stop make a left and remain on Broken Lance, about .75 mile you’ll find one entrance to Mill Run on the right. The address is technically all the way around the Broken Lance Loop and that’s where you’ll find the other entrance to Mill Run, or after the next right and then right into the driveway. Contact us today to find out how we can help you find your dream home in Breckenridge. An expert is waiting to talk to you!